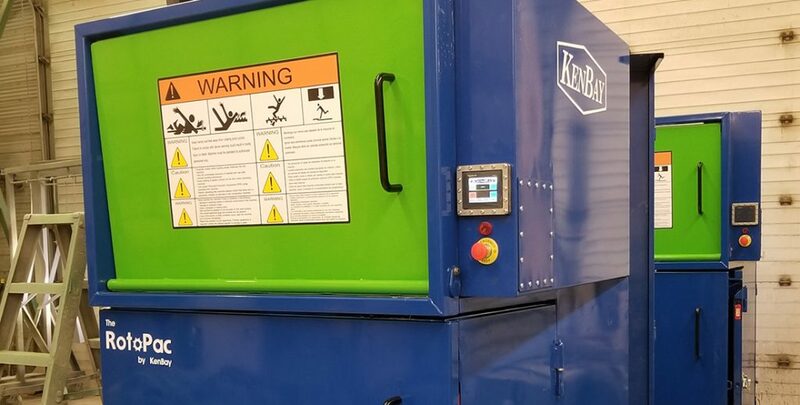 The result is a commercial trash compactor designed for both simplicity and longevity, one that applies continuous waste compaction through higher-than-expected torque. It’s what we like to think of as the workhorse of the industrial waste compaction field. 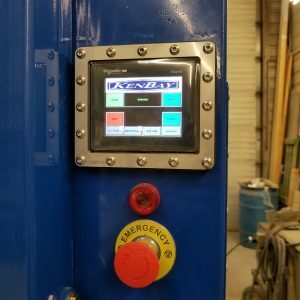 At the same time, we recognize that any invention has room for innovation, which is why KenBay has made several enhancements to the RotoPac commercial trash compactor over the last year. The RotoPac has evolved into a smart machine over the last few months. The PLC allows us to automate the RotoPac with other devices – blowers, conveyors – to start the compactor from the production area. The RotoPac will issue a five-second warning buzzer to alert anyone in the area that the machine will begin compacting. The power source can be either 208V (three phase) or 480V (three phase). We’ve also added new leveler legs for more stability, allowing the RotoPac to do its job on slightly uneven surfaces. These aren’t the only changes we’ve made. We’ve added an optional electronic eye which can remotely trigger this commercial trash compactor to run for a set cycle. This is a critical feature for anyone dropping material from a mezzanine or higher level, allowing only one operating control on the RotoPac and eliminating the need to run the machine from above when workers are ready to send down material. Once the material passes the electronic eye, the RotoPac will turn on and run for the indicated time and then switch off until the eye’s beam is broken. We’ve also added the option for a “Bag Full” alarm that’s sent electronically to remote devices. 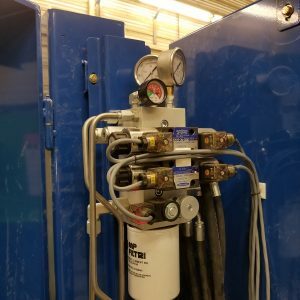 This is very useful in environments where automation such as a blower or conveyor is at work in tandem with your commercial trash compactor. The PLC can be programmed to allow a floor operator ample time to reach the RotoPac and switch out the bag before it’s full. To learn more about the new smart RotoPac, contact KenBay. We look forward to showing you how this enhanced waste compactor can make things easier and safer for you and your workers.